A blog dedicated to recent publications in the field of Nanomagnetism. A selection of links to articles in the most important topics of magnetism of nanoparticles and nanostructures will appear here in a regular basis. Comments and discussion about the results will be welcome. Standardisation of magnetic nanoparticles in liquid suspension. Results of the NanoMag European FP7 project that aims to standardize, improve and redefine analysis methods for magnetic nanoparticles. 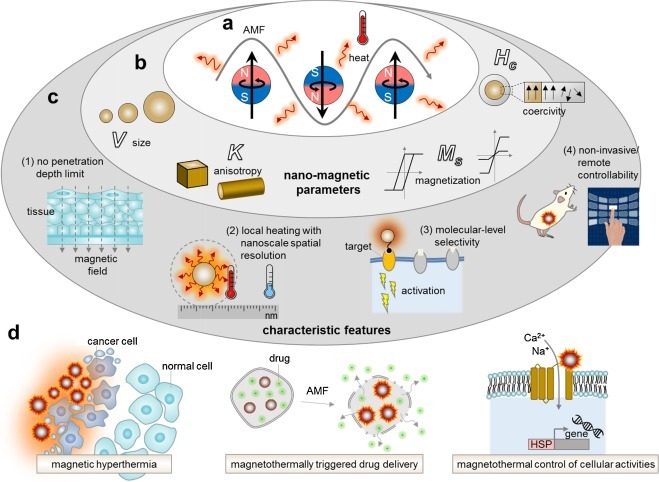 Drug releasing nanoplatforms activated by alternating magnetic fields. Techniques in micromagnetic simulation and analysis. Tuning the coercivity and exchange bias by controlling the interface coupling in bimagnetic core/shell nanoparticles. 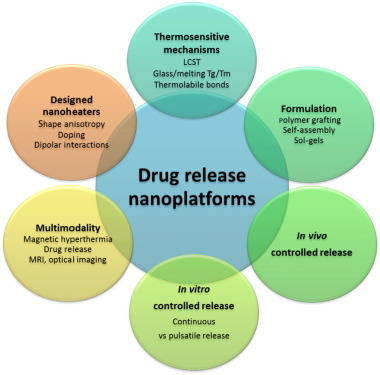 Recent advances of magneto-thermal capabilities of nanoparticles: From design principles to biomedical applications. Direct Observation of Interactions between Nanoparticles and Nanoparticle Self-Assembly in Solution. Impact of the Metallic Crystalline Structure on the Properties of Nanocrystals and Their Mesoscopic Assemblies. The relation between structural atomic lattice and the degree of crystallinity of NP is nicely demonstrated here. Moreover, properties (mechanical, growth processes) of supracrystals also change with the nanocrystallinity of the nanoparticles used as building blocks. Surface spin canting in Fe3O4 and CoFe2O4 NP probed by high-resolution electron energy loss spectroscopy. Experimental L3 spectra of CFO recorded (a) and (c) at room temperature and (b) and (d) at liquid nitrogen temperature (77 K) for Fe and Co atoms, respectively. The spectra from core and edge of nanoparticles are colored with green and red, respectively. Dominating features from Td and Oh atomic sites are marked. Kindly note the fine features are only sharper for Co atoms, but not for Fe atoms, suggesting possible formation of uniformly oriented spin canting configuration for Fe atoms but core-shell morphology for Co atoms. Imaging techniques: X-rays used to watch spins in 3D. Temperature-Induced Increase of Spin Spiral Periods. Magnonic analog of relativistic Zitterbewegung in an antiferromagnetic spin chain. (a) A positive wave packet and a negative packet that both have positive wave vector move in different directions. The amplitude |ψ| is used for plotting. (b) Two positive wave packets with different wave vectors move toward each other too. (c) The normalized average position ⟨ξ⟩ as a function of time for the two cases. Relativistic theory of magnetic inertia in ultrafast spin dynamics. is depicted by the blue solid-dashed curve, and the nutation is shown by the red curve. Magnetic Möbius stripe without frustration: Noncollinear metastable states. Equilibrium MC configuration of a chain consisting of 100 moments for D=1, K=0.4 meV, J=−40 meV: (a) closed KB configuration and (b) the same shown with open ends for clarity. Imaging magnetic vortex configurations in ferromagnetic nanotubes. XMCD-PEEM images of a 6.9-μm-long Py NT with (a) ˆk⊥ˆn and (b) ˆk∥ˆn and of a 7.2-μm-long CoFeB NT with (c) ˆk⊥ˆn and (d) ˆk∥ˆn. Dashed outlines indicate the positions of the NTs. Panels (e–h) represent 2-μm-long IXMCDlinecuts along the corresponding colored dashed lines in (a–d). In the linecuts, the background intensity is indicated by the level of the horizontal dashed lines and vertical dashed lines delineate the boundaries of the NT. Panels (i) and (j) show simulated remnant magnetic states for a NT with l=2.1μm and d=245 nm. Both configurations are mixed states with an axial central domain and vortex ends of either (i) opposing circulation—consistent with (a) and (b)—or (j) matching circulation—consistent with (c) and (d). The color scale corresponds to normalized magnetization along ˆy. Arrowheads indicate the local magnetization direction. Dzyaloshinskii-Moriya Interaction across an Antiferromagnet-Ferromagnet Interface. (a) Schematics of BLS experiment and possible atomic arrangement at the interface. (b) BLS spectra for DE spin waves recorded at a fixed incident angle with k=16.7 rad/μm under oppositely oriented external magnetic fields H. The solid lines represent fittings with Lorentzian functions. Novel domain wall dynamics in synthetic antiferromagnets. Illustration of the ECT driven DW motion in SF (a) and SAF (b) wires in the presence of spin Hall torque and DMI field. Magnetic skyrmions: advances in physics and potential applications. Noncentrosymmetric Magnets Hosting Magnetic Skyrmions. Equilibrium magnetization and magnetization relaxation of multicore magnetic nanoparticles. Left: Visualization of a dense random cluster containing N=100 nanoparticles prepared as described in Sec. 3a. Right: Visualization of a cluster containing N=100 nanoparticles prepared by DLCA with Qdd=2 and ɛ=4 as described in Sec. 3b. Thermal Decomposition Synthesis of Iron Oxide Nanoparticles with Diminished Magnetic Dead Layer by Controlled Addition of Oxygen. Decades of research focused on size and shape control of iron oxide nanoparticles have led to methods of synthesis that afford excellent control over physical size and shape but comparatively poor control over magnetic properties. Popular synthesis methods based on thermal decomposition of organometallic precursors in the absence of oxygen have yielded particles with mixed iron oxide phases, crystal defects, and poorer than expected magnetic properties, including the existence of a thick “magnetically dead layer” experimentally evidenced by a magnetic diameter significantly smaller than the physical diameter. Here, we show how single-crystalline iron oxide nanoparticles with few defects and similar physical and magetic diameter distributions can be obtained by introducing molecular oxygen as one of the reactive species in the thermal decomposition synthesis. This is achieved without the need for any postsynthesis oxidation or thermal annealing. 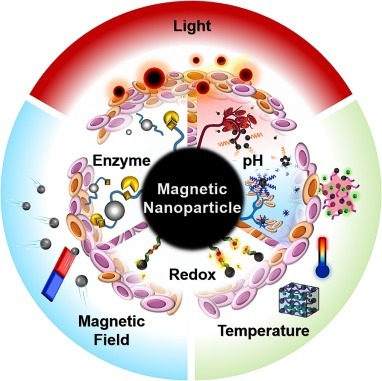 These results address a significant challenge in the synthesis of nanoparticles with predictable magnetic properties and could lead to advances in applications of magnetic nanoparticles. Standardizing Size- and Shape-Controlled Synthesis of Monodisperse Magnetite Nanocrystals by Identifying and Exploiting Effects of Organic Impurities. Size-Dependent Heating of Magnetic Iron Oxide Nanoparticles.